For the first time since I began growing my own, I’ve kept the promise to myself to have patience when sowing the first seeds. It’s difficult, isn’t it? We spend so much of the winter longing to get our hands in the soil, planting those tiny seeds of hope. I’ve always found it hard to hold back as we move into the New Year and for years I’ve slipped a few seeds into compost and relieved the pent-up excitement to get growing. However, it can be a rocky path to take. There are many things that may ruin the sowing party. The light levels are not long enough during the day and the temperature is still low. Ultimately, my seeds fail to germinate or grow weak and leggy and those that survive are comfortably caught up by the later sowings I make. Don’t hold rigidly to what the backs of the seed packets say. The seed merchants try to cover the wide range of sowing and harvest times for the entire UK. As much as the impatience is eating you up inside, it’s valuable to use your own local knowledge and common sense and choose the most appropriate time to sow for your own particular situation. This in part comes from experience. Charles Dowding has become a huge influence on me since reading his books over the winter. I’ve moved to a no-dig approach on the allotment and I have also decided to make use of his 35 years of growing experience and utilise his suggested sowing times for individual crops. Earlier this week, I bought a new plastic greenhouse for the garden from Wilko. I’ve had a smaller one for a number of years and it’s held up very well. It’s been a valuable resource to start off seedlings. The upgraded model is slightly bigger and will comfortably allow me to start more seeds off and the advantage is it’s close to the house, which enables me to tend to their needs very easily throughout the week. I’m sowing a week or two later than planned. Charles’ sowing season begins on 14th Feb. It’s around this date the UK begins to receive over 10 hours of sunlight – a key component in plant growth. The important factor is sowing crops suitable for early sowing undercover. On an overcast day, into modules, I sowed Ailsa Craig onion, Boltardy Beetroot, Blauwschokker Peas and Kelvedon Wonder peas. There are a few more vegetables I hope to sow throughout the month of March. It’s been a busy couple of weeks for me and it’s taken me away from the blog and the allotment. However, I’m very pleased to be back sowing, growing and talking about it. As well as getting some crops sown and on their way, I have managed to keep up my reading and plans for the allotment garden. There are three topics that have taken my interest and I will write articles on them in the coming weeks and months. Firstly, no-dig. As I explore this further, there is much more to think about and discuss. Secondly growing for winter harvests and covering the ‘hungry gap’ period between April and June. I would like to have an allotment that provides fresh produce for the entire year. Thirdly, this might sound a little strange considering the size of the plot I have available to grow in, but square foot gardening principles have taken my interest and I’d like to explore these on the plot. I’m slowly creating an overall strategy in my head of how these topics can come together to form a model for effective, efficient and productive allotment gardening. As this becomes clearer, I will certainly be articulating my thoughts on the blog. There is more than seeds to enjoy if you are passionate about your garden or allotment. I recently bought this wonderful handmade sign from Darren Lakin. 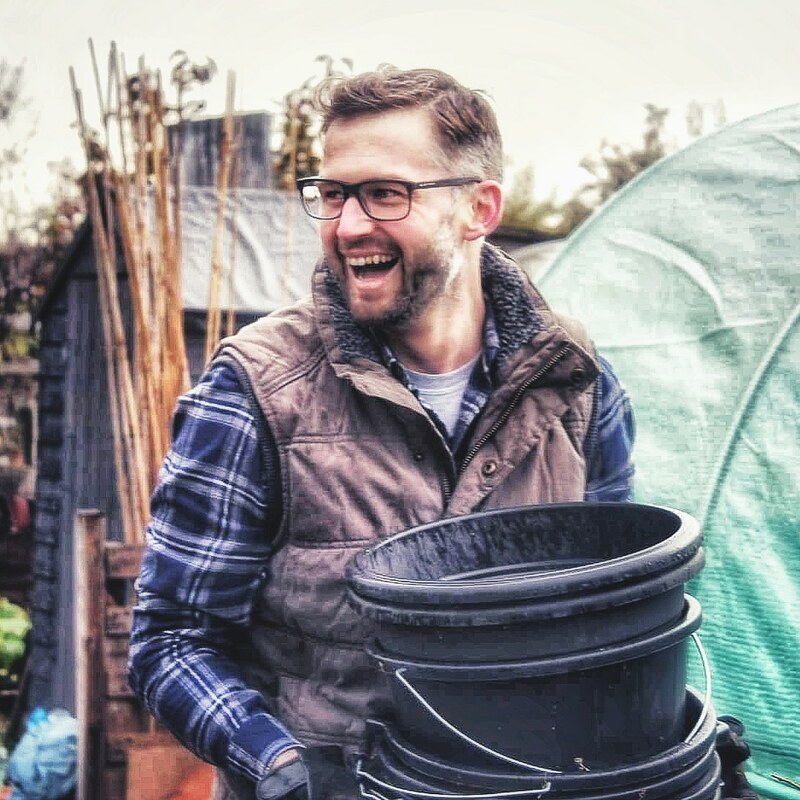 Darren is a hugely talented creator of beautiful garden products – he’s very clever. If you haven’t already, check out Darren’s work on Twitter or Instagram. Over to you. How’s your allotment and kitchen gardens coming along as we move into spring? What have you sown and how are your plans for the year coming together? Let me know in the comments below. I’m still experimenting and figuring out the climate to get the right timings for starting seeds. I started tomatoes and chili peppers at the beginning of the year and are starting sweet potatoes, kale, peas, beetroot, chard, salads, herbs and flowers. I had one fellow gardener tell me his tomatoes and squashes are already in the ground whilst another told me to not plant out until the snow is gone from the mountains because late snow is not uncommon. I’ll only find out trying it for myself! Seems to me the weather varies so much from one season to another that what works well one year may fail completely another. I’ve sown small quantities of a few things intending to sow more later. If they work, I extend my season, if they don’t it’s no big deal. At least raising plants in cells or pots you can hold back on planting out until conditions are fair. I direct sow very little. I’ve been no-dig for a couple of seasons, not remotely tempted to go back to my old ways. I’ll be following with interest – I’ve just started to find out about no dig as well and I’m really keen to try out that approach in my first year of veg and fruit growing! I used to have a “rule” in my allotment days, kept it through my veg patch days and now apply it to my flower patch(es). You can sow too early but (within reason) you can’t sow too late. Nature has a wonderful knack of catching up, you know. Remember all the talk about succession sowing? Sow a bit later, crop a bit later. Why worry? Think about when your crops prepare their seeds for the next year. Left to themselves, runner beans would sow their seeds in the autumn. You’ll be told to sow foxglove seeds between January and July. Your foxgloves will produce their seed in August. Work with nature. Not with the words on a seed packet. Absolutely excellent observation and advice John. I think it’s become a strange framework that we feel we have to work in. I have been guilty of it. It’s very difficult to change a process that has been ingrained for so long. Some of the things we do now improve the performance of gardening but there is plenty that just doesn’t. I agree with John’s comments, to a certain extent, but you have to remember that many of the plants we cultivate in our plots are not native to the UK, and many of them come originally from warmer climes. If you let the Runner Beans and chillis and tomatoes do their own thing you probably wouldn’t get a very good harvest. We have to make some compromises with Nature! But I do agree that sowing seeds too early is poor practice, and that these days it seems almost to have developed into a race to see who can sow earliest! Extending the harvest with the aid of cloches, fleece, mini-greenhouses etc is a sensible use of modern technology. Mark’s spot on, of course, as usual. Though I wonder whether he’s the Brexit equivalent in gardening circles. You know, have a discussion about street lighting and someone will introduce Brexit. Have a discussion about gardening and Mark will introduce chillis! Sorry Mark, I’m joking! Seriously, though, my Mum used to grow lots of tomatoes (and cucumbers with knobbly skins that we were told by Dad never to talk about). One year, as usual, we ate those wonderfully sweet fruits. Then she made lots of green tomato chutney. Then she ended up with one fruit, manky looking, shrivelled, destined for the compost heap. This was September or October, I forget which. But the fruit was plucked, The seeds were extracted and sown in pots (in September or October, I forget which). The following year, those seeds produced a bumper crop of the sweetest, juiciest tomatoes I’ve ever tasted. And Mum continued to extract seeds, and we continued to enjoy the fruits, until she died. I could never get the buggers to grow. But then her favourite “mini-shrub” marigolds died with her too. I remember things like that on Mothers’ Day. Got a book by Charles Dowing and have made a small no dig bed. Looking forward to seeing how things grow so thank you for that. My old dad used to say don’t rush to sow seeds too early. Growing peas in guttering for the first time and they are doing well. First early potatoes in pots coming up. Growing maincrop Sarpo Mira for the first time this year, recommended by Dan from Allotment diaries. Have been inadvertently doing no dig for years by um not digging! Very happy that my lazy approach has caught on… I find it next to impossible to resist the temptation to sow on the first day of the first month the seed packet ‘permits’. Especially difficult after a winter of being cooped up drooling over seed catalogs. I’m running a trial this year to prove to myself that this is pointless and that later sowings do better and catch up, mostly. See under Trial 02 at my blog, thepropagatorblog.wordpress.com if interested. I’ve been a big fan of Charles Dowding for many years and, happily, I’ve arrived at no dig in the veg patch where I live but the allotment has been “tended” by other people in the past who neglected to weed. I’ve dug out a lot of perennial weeds and mulched – hopefully we’re now back on track for no dig at the plot as well. Good idea to think about winter veg now – a quick look around some of the more established plots on your site will show you what you can grow. I always have kale, chard, beetroot, carrots, PSB and a few salad leaves (rocket etc) and am having a go at leeks this year as well. Yayy!